Chicago Bulls center Robin Lopez (42) is defended by Philadelphia 76ers guard Jimmy Butler (23) during the first half at United Center. It's not often you have such a bad performance that you get to lose twice in one night, but thanks to a faulty decision from Chicago's clock operator, the Sixers earned that distinction on Wednesday night. Two attempts to win the game at the end of regulation came up short, and the Sixers fell to the lowly Bulls 108-107.
Who knows if they'll have to give the Sixers another chance to win by the time you read this recap, but here's what I saw in a pretty terrible loss. • On Tuesday night against the Magic, it was easy to forget that Jimmy Butler was even on the floor for most of the first half. It was a much different story against the Bulls on Wednesday, with the Sixers making it a point to go to Butler early against the Bulls. Butler got involved away from the ball, taking advantage of some great ball fakes from Ben Simmons to get easy looks at the rim. 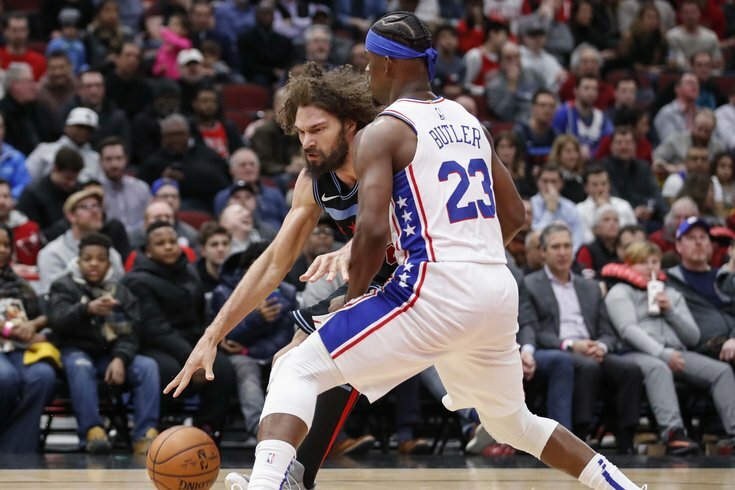 But Brett Brown also put the ball in his hands sooner than he has in a lot of recent games, using Butler at the point guard spot, and with guys like Ryan Arcidiacono checking him the Bulls had very little chance to keep up with Butler. When they did, he used their inexperience against them and drew fouls. This was the Butler we got used to seeing right after he arrived in Philly. He was unselfish and found teammates on the perimeter with good passes, but he struck a nice balance between deferring and hunting his shot. That's the Butler they need. That applies double when he comes up with what should have been the game-winning free throws as time ticks down in the fourth quarter. Butler has had struggles at the stripe in clutch situations this year, but he delivered on Wednesday night. Unfortunately, they didn't really matter. • For playing exactly one stretch of eight minutes where he looked like a competent NBA player, I'd like to congratulate James Ennis for winning the "tournament" Brown says is underway for the bench players. Well done. Ennis did an excellent job filling the blanks for the Sixers on Wednesday night, keeping the ball moving on the perimeter and providing more than just standstill shooting. He had another nice moment in the first half against Chicago, using a pump fake to get by a defender on the perimeter before coming up with a nice lefty finish at the rim. Just as important? His work on the defensive end. There weren't really any standout plays, but Ennis kept himself in good position throughout the night and used his length to bother Bulls shooters. He has been the guy I've expected to win the bench battle in the end, but Jonathon Simmons has had more opportunities to prove himself so far. We'll see if this holds up. • In a game that featured a lot of apathetic defense across the board, I thought Ben Simmons was one of the few guys who was relatively engaged throughout the night. He made some nice plays away from the ball, which is his problem area if he has one on defense, and he helped keep things together on a night that was filled with apathetic performances. Leaning toward the latter. Getting cooked by a guy who self-assigned himself to the G-League seems bad for a franchise cornerstone. • You can tell why Brown is reluctant to trust Jonah Bolden on nights like Wednesday. Sure, the rookie big man sprinkled in some nice plays that are uncommon for guys his size, and when he was in the right position, he proved capable of offering outstanding rim protection. But part of being a full-time center is being the leader on the back end, and Bolden just looks downright confused at times. That actually bled over to the offensive side of the ball on Wednesday. The Sixers were struggling to get into sets at times against Chicago, and Bolden was a culprit in that problem. There were several occasions when teammates had to push or point him in the right direction, stalling a play and forcing them to adapt on the fly. That's obviously not ideal. To be clear, they still should commit to playing him and letting him figure things out, provided he isn't costing them games. But this is a reminder that there is a cost for that. • If you're getting roasted by Robin Lopez in the post for an entire quarter in 2019, I think it's fair to say you need to do a little better defending the paint. It's not as though Philadelphia defended guys in space much better than they did Lopez, either. That's sort of the problem with playing Amir Johnson — his instincts are correct and he makes good decisions, but with his legs failing him at this point, he often can't make the play anyway, and it ends up leaving the Sixers exposed on the plays that follow, whether it's an offensive rebound or continued ball movement. • Tobias Harris has been tremendous for most of his time in Philadelphia, but Wednesday was a rare bad night. Does any of that stem from Philadelphia changing their strategy early in the game? That's probably worth asking. The cost of forcing the ball to Butler early is that it goes away from the guy who has driven Philadelphia's early success in a lot of games lately. Harris tends to get out to big starts, even dating back to previous stops around the NBA, and he never even really had a chance to do so against Chicago. It's ultimately a team game, and I don't think Harris is the sort of guy who is going to put up a stink because they went away from him for a half. But, as we've seen with Butler, these guys are going to have to learn how to adjust to different circumstances on the fly. Harris never got it going in Chicago. • JJ Redick feels like he is 0/150 on open shots in crunch time recently. It's a bit problematic. • Philadelphia's problems in crunch time are connected to a lot of different players and things, but Simmons is at the center of it. People like to point to the floor-spacing stuff all the time, but I think the bigger issue is that he does not respond to those situations well enough yet. After coming up with a monster turnover in the final minute, Simmons gave the ball right back to Chicago by pressing the issue in transition and playing out of control. There's no need to rush the ball down the floor there, but Simmons' instinct to play fast at all times came back to bite him. • The Bulls went right down Main Street for the final few minutes of the game with the Sixers playing small, and they went back and forth between Zach LaVine making layups and Robin Lopez producing offensive rebounds. That would have been a good time to make any sort of adjustment, whether we're talking personnel, defensive responsibilities, whatever the case may be. It was the stubborn decision to leave things as they were that cost Philadelphia in the end. The Bulls did not do anything special on the game-winning play, but they did exploit Mike Scott for about the 15th straight time. Maybe exploit is charitable to Scott there — he had absolutely no idea what he was supposed to be doing, and Zach LaVine had a damn runway to the rim. He should not have been in a position to make that mistake in the first place. After getting brutalized for the final few minutes, you have to go to a different look there. It's not as though Scott was giving you anything on the offensive end, either. The game is much bigger than those few minutes to close the game, but Brown needed to make an adjustment, period. He owns a big portion of that loss. • Back-to-back games in March should be illegal. When people make sweeping generalizations about the NBA product, games like these are what they can point to. Neither team had a ton of juice in their legs, defensive rotations were not super crisp, and it did no favors to anyone either from a competitive or entertainment perspective. There was a play where a ball hung in the air above JJ Redick's head and he just watched it fall to the floor as Chicago picked up an offensive rebound. No bueno. Without Joel Embiid, the Sixers are not good enough (or at least deep enough) to mail in stretches of games without being punished for it. • Chicago's clock operator should be ashamed of himself. How do you start the clock with the ball in-mid air? Congrats on being Chicago's version of the confetti guy who celebrated too early in the Sixers vs. Celtics series last year, my man.